Many people reading this article perhaps grew up in a realm of books, and finding a book to read, perhaps, was never that difficult. But not everyone in Nepal gets this opportunity. People often argue that everyone in Nepal must have access to education. But, those making such an argument fail to realise that just having access to education alone is not enough; what people need is the opportunity to read books in the format understandable to them. The ‘right to read’ is, therefore, related to the access of reading materials, in print or any other readable format. None of the international treaties establish the right to read as a human right. But there are series of recognised human rights which—based on interpretation—do incorporate the right to read. It can be traced from the rights enshrined under International Convention such as the Universal Declaration of Human Rights (UDHR) and International Covenant on Economic, Social and Cultural Rights (ICESCR). For example, Article 26 of the UDHR states that “everyone has the right to education”. Similarly, other international conventions have also reaffirmed the importance of the right to education. Generally, the right to education is understood as an obligation of a state to provide free education up to secondary level. However, under rights-based analysis, the right to education gives rise to other several rights associated to it. So it is often called an ‘empowerment right’, which means that it is a facilitator or medium to achieve other forms of human rights. Therefore, the right to read is one facet of the right to education. There can be no right to education if there is no access to textbooks or other reading materials. Likewise, the right to read also seeks support from freedom of speech and expression. Professor Lea Shaver writes about three dimensions of the right to read in her work, ‘The Right to Read’ (2015). First ‘liberty’, where she emphasises the right to read as a freedom to read and write in one’s preferred language. Second ‘capacity’, where she asserts that freedom to read and write cannot be exercised unless a person possesses the practical ability for it. Third, and most important, ‘availability’, where she argues that the liberty and capacity to read become meaningless unless a person has access to reading materials. In 2013, the ‘Marrakesh Treaty to Facilitate Access to Published Works for Visually Impaired or Otherwise Print Disabled Persons’ was signed as an International Treaty to update international copyright laws. It was a result of intensive lobbying from the World Blind Union and developing countries, particularly India. According to the World Blind Union, more than 90 percent of all published materials cannot be read by blind or print-disabled people. 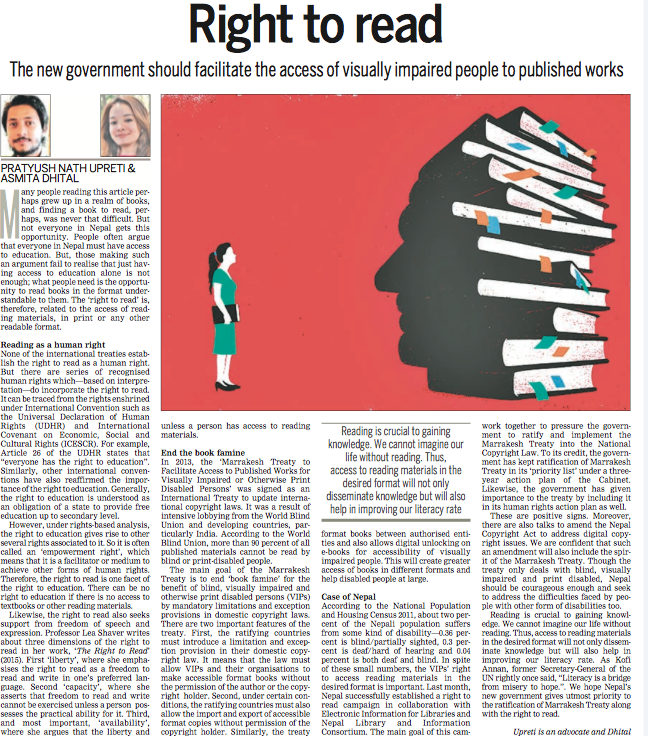 The main goal of the Marrakesh Treaty is to end ‘book famine’ for the benefit of blind, visually impaired and otherwise print disabled persons (VIPs) by mandatory limitations and exception provisions in domestic copyright laws. There are two important features of the treaty. First, the ratifying countries must introduce a limitation and exception provision in their domestic copyright law. It means that the law must allow VIPs and their organisations to make accessible format books without the permission of the author or the copyright holder. Second, under certain conditions, the ratifying countries must also allow the import and export of accessible format copies without permission of the copyright holder. Similarly, the treaty enhances cross-border accessibility of format books between authorised entities and also allows digital unlocking on e-books for accessibility of visually impaired people. This will create greater access of books in different formats and help disabled people at large. According to the National Population and Housing Census 2011, about two percent of the Nepali population suffers from some kind of disability—0.36 percent is blind/partially sighted, 0.3 percent is deaf/hard of hearing and 0.04 percent is both deaf and blind. In spite of these small numbers, the VIPs’ right to access reading materials in the desired format is important. Last month, Nepal successfully established a right to read campaign in collaboration with Electronic Information for Libraries and Nepal Library and Information Consortium. The main goal of this campaign is to create a public opinion and work together to pressure the government to ratify and implement the Marrakesh Treaty into the National Copyright Law. To its credit, the government has kept ratification of Marrakesh Treaty in its ‘priority list’ under a three-year action plan of the Cabinet. Likewise, the government has given importance to the treaty by including it in its human rights action plan as well. These are positive signs. Moreover, there are also talks to amend the Nepal Copyright Act to address digital copyright issues. We are confident that such an amendment will also include the spirit of the Marrakesh Treaty. Though the treaty only deals with blind, visually impaired and print disabled, Nepal should be courageous enough and seek to address the difficulties faced by people with other form of disabilities too. Reading is crucial to gaining knowledge. We cannot imagine our life without reading. Thus, access to reading materials in the desired format will not only disseminate knowledge but will also help in improving our literacy rate. As Kofi Annan, former Secretary-General of the UN rightly once said, “Literacy is a bridge from misery to hope.”. We hope Nepal’s new government gives utmost priority to the ratification of Marrakesh Treaty along with the right to read.